Now im not going to spend a whole lot of time typing a reply. But im giving my 2cents on the discussion of a mapsize. I like both. i like the more smaller maps based on infantry altough it is a grind sometimes. Overall they perform good. On the other hand i would love to see some larger (fh2) (stock) maps make it into the game. formost reason for me is the feeling that you are on a battlefield and that you as a player have a choice in what you want to do in that map. playing infantry, driving tanks or flying aircraft ect. this does not mean that the ''flow'' of a map will be compromised. It is your job to create such a story when you make a push map. It is not your job to put push on maps in order to keep people from back capping or because you feel the player density is not high enough on your map. There are better, more elegant ways to fix those problems. Sector Push is the simplest way to achieve this goal, but it is also a limited one: The defending team is forced to defend, the attacking team is forced to attack. Beyond recapping single flags, there is usually no option for the defenders to drive back the attacker. This simplicity is a strength when used right, but can get really frustrating if done wrong or if one team is noticeably superior to the other. The biggest danger is a crushing victory by the defending team: This is the least fun outcome for either side, since the “narrative” simply stops at some point and turns into a meatgrinder over the same area. Because of this it is advisable to give the attackers a slight advantage. If in doubt, buff the attackers. When it comes to flow, the same basic principles apply as for conquest maps. Again reality is more complicated than the generic layout, but the basic principles are visible: The sectors are well defined and distinct: You start in the open terrain of the Oder river valley, fight up into the hills of the Seelow heights and end in the bombed out town of Seelow. The narrative is clear. Note also the use of bottlenecks, especially between the first and second sector. There are four ways up the hills: Across the bridge in the center, the open flanks in the north and south and the more hard to use, sneaky path between the two flags. The use of team spawn points is essential to the success of a sector push design. Defenders should always spawn behind their flags and never between the flag and the attacker. The fewer flags a sector has, the more important this becomes, because taking a single flag with all defenders spawning all over it is almost impossible. It is best to designate dedicated spawning areas when designing a sector, providing cover and quick paths into the flagzone. When it comes to ticket setup, usually both teams should have the same amount of tickets. This is to prevent the attackers from winning by simply outkilling the defenders, which happened on earlier push maps quite a bit. Once the final flag is taken, a very quick bleed drains the defending team’s tickets. It is up to the mapper if the last flags are recapturable or not. If the bleed for the defenders starts earlier, they can’t effectively recap their flags due to the Sector Push layout, leading to a very annoying end to the round. If you want a push map where not all flags have to be captured for bleed or a more complex, dynamic layout, use the new adaptive push code. Forgotten Hope 1 was one of the first BF1942 mods to incorporate push mode. Due to coding limitations, these maps tended to be simple: You simply captured the flags in a certain order, one at a time. When Forgotten Hope 2 came out, it had become possible to create all kinds of different push layouts and in the first versions of that mod (2.0 – 2.3) people often went with very complex push layouts. This changed after 2.4 and the release of Hurtgen Forest. It had become apparent that these overly complicated push layouts were not really working as intended. At best they were slightly awkward conquest maps, at worst a confused, unfocused mess. This led to the development of Sector Push mode, which was retrofitted on many earlier maps (on some more successfully than on others). In 2.5 a new type of push was released: Adaptive push, with Pegasus being the flagship map for it. 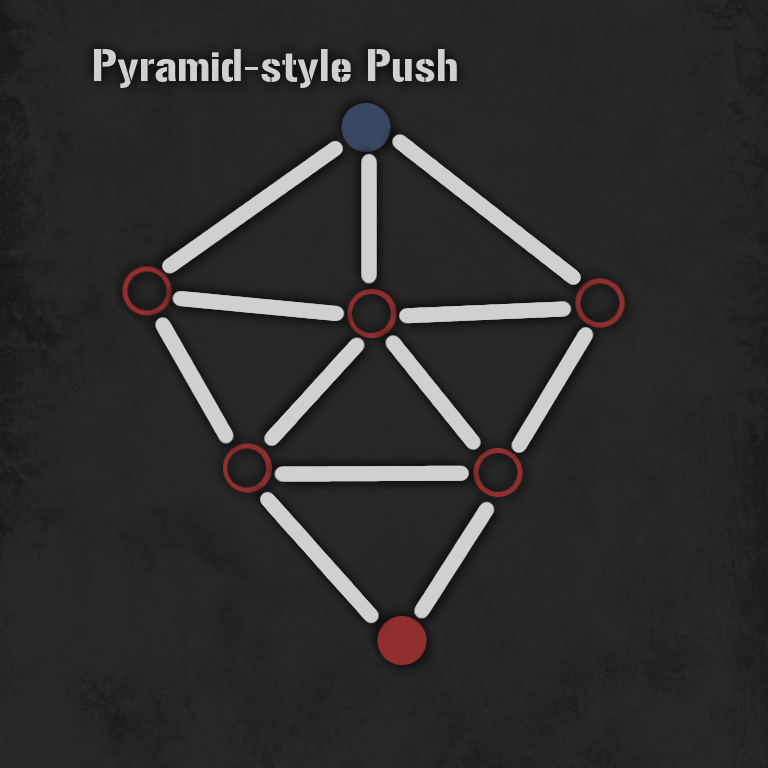 At this point I would consider only 2 types of push in the mod, namely Sector Push and Adaptive Push. Sector Push was already described. Adaptive Push can be used to create more complex scenarios that allow the defenders to gain back flags and more varied bleed conditions. To avoid the pitfalls from earlier push maps, here are some helpful guidelines. Make sure the amount of flags open is limited. This seems obvious, but look at examples like Saint Lo Breakthrough. There are stages in this map that feature 6 capturable flags at the same time, more than most standard conquest maps. At this point you have to ask yourself: Maybe a conquest map would be the better solution? There needs to be an obvious progression similar to a Sector Push map, it just has to go into two directions. Ideally the counter-attack should represent its own narrative. At the same time, the defenders getting back a flag can be extremely frustrating to an attacking team, who is now forced to turn around and backtrack, often while being on a very fun attack that is now cut short. To circumvent this, an Adaptive Push map needs to be designed differently from a Sector Push one. Instead of having clearly defined sectors, the flags unlocking each other need to be close to each other, to create a flow “flag to flag”, not “sector to next sector”. Lastly, whenever the bleed goes over to the defending team, this should also represent a shift in initiative, meaning the attackers should get a sense of “We came this far, but now we have to hold out to defend.” The easiest way to achieve this is by giving the defenders reinforcements or taking away attacking team assets, but it can also be built into the push layout. Ideally the point where the bleed stops should also be the point where the attackers have more flags to defend than to attack. This represents a scenario of overextension, where an attacking team has to divert resources from the attack or suffer the consequences of lost flags. Adaptive push mode has an additional feature that I will mention here but cannot comment on much, because there is no map except Brest that really takes advantage of it in its design and it is presently bugged in the public version. It is possible to have flags “cut off”. You may have noticed this on Brest. Basically, if a flag gets “isolated” from all nearby friendly flags due to these being capped, it becomes cut off, meaning the spawn points connected to it are disabled. I could picture a big map with lots of flags taking advantage of this by making encircling enemy flags a major component in gameplay. This kind of layout can be found on Lebisey and Sammatus, as well as on Siege of Tobruk in slightly changed form. The bleed on this kind of map should be set up like on a conquest map, meaning the team holding three flags inflicts bleed. They can attack on a broad front, trying to get the three frontline flags at once. This can be easier, since they are closer to the own mainbase and tank reinforcements. However, you have to defend three flags now, meaning you are now effectively in the position of the defender. This is the kind of initiative shift I mentioned earlier. If attacking on a narrow front they will try to capture a second line flag, thus going closer to the enemy main and risking being cut off if a flag behind them is recaptured. However, if this is achieved, the attackers have a very good position, because they have only one flag to defend and are forcing the defending team’s hand. Lebisey works perfectly like this. A possible next step for this layout could be to use Adaptive Push to mirror it, meaning three flags in the center and two for each side. This could create a map where the front is pushed back and forth, with the side having fewer flags getting more tanks. 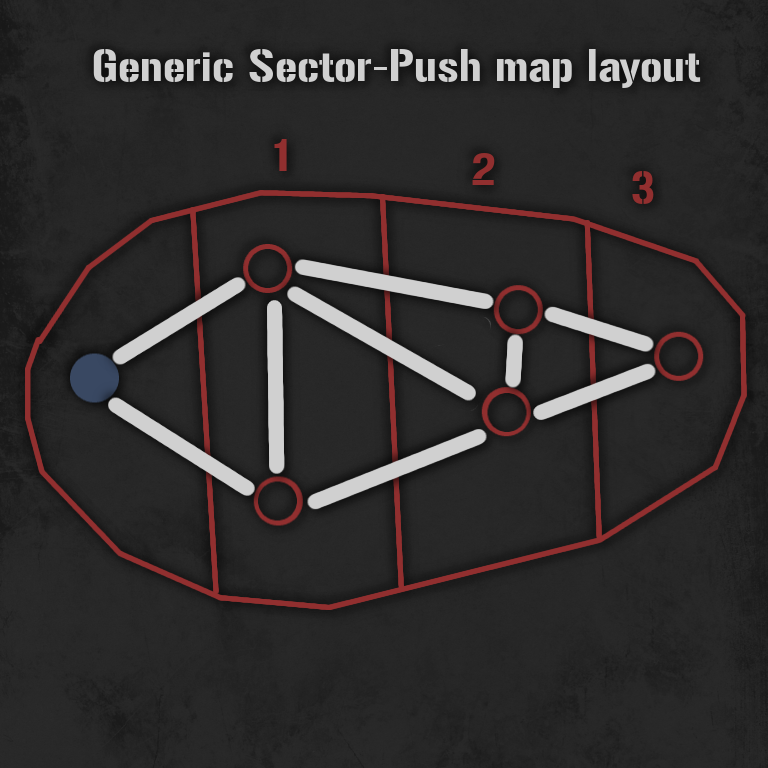 Finally I would advise an inexperienced mapper who wants to create push map to go for Sector Push first: It is the simpler and more elegant solution, with fewer variables to think about. The higher the density, the more players you will interact with. There is no exact formula for this, it can’t be expressed in numbers, like “This map has a player density of 3.5”, but it is something to keep in mind. There is also no rule about how high or low player density needs to be on an FH2 map and in fact it varies a lot. Before I explain all the elements that affect player density, I will talk about what will happen if the density is too high or low. Too high density will lead to one of two scenarios. If the map is characterized by bottlenecks and progression, it will result in stalemates and terrible meat grinding. Especially if the map is close combat oriented, you will see player stacking up and spamming nades at certain chokepoints, leading to extremely static, frustrating and ultimately boring gameplay. Tunis is an example of this, which is why grenades have been heavily limited on that map. Note that if your map requires you to limit a basic item such as grenades (and it is not some kind of weird or special scenario) you probably have a problem on it. If the map is more open or just unstructured, but player density is still too high, you will get spammy “Call of Duty” type gameplay, where you cannot predict where the enemy will come from next or where a firefight will occur. There will be short lives and quick battles. This can be fun to an extent, but due to the extremely high weapon damage in FH2 it gets old really fast. Each engagement turns into a meaningless frag without context. Too low player density will lead to a map where it is too easy to avoid combat. This can have several effects. In some maps it leads to “flag carousel”, meaning flags change hands with little or no player interaction, leading to the feeling that one is chasing the enemy from flag to flag without actually fighting all that much. It can also lead to a situation where the terrain outside of the flagzones is, for all intents and purposes, “skipped”, meaning gameplay and combat only occurs in flagzones. In this case the area between flags is basically indefensible, so hunkering down in the flagzone and watching as many different angles as possible is the only sensible tactic. Here too the combat feels meaningless and random. If an enemy is met, there is no way to anticipate it. 3.1 What affects player density? A square area of 500 x 500 m, completely flat and empty, has two players with rifles in it. Obviously they would see each other within seconds and engage, meaning player density is extremely high. Now imagine the same area, but filled with random overgrowth: trees with low hanging branches, bushes etc. Suddenly player density is extremely low, even though the map size has not changed. The two players could search for each other in that forest for minutes without result. Note that random, meaning unpredictable placement of concealment causes this even more. There is a difference between having a hand placed line of hedgerows and 10 random bushes, each of which could house a player. The earliest versions of Purple Heart Lane had way more concealment than the final version, but it was found in testing that gameplay was too random. This is a sign of too low player density. The same is true for open buildings or very complex heightmaps. Imagine Point du Hoc without any craters if you have doubts about this. This is especially important to keep Sector Push Maps playable. Imagine the last sector on Omaha Beach, except the Germans can spawn in the church. It would probably be harder than the beach section, and less fun for both sides. As if this wasn’t complicated enough, no map has the same player density in every area. Players cluster around flags, villages have different densities from the surrounding terrain and to make matters worse, servers play maps with different player counts. Of course this does not mean that a mapper has no control here, just that it is an extremely complex issue. Generally speaking, using the list above, make sure not to go into one of the two extremes. Do you have a huge map with lots of flags? Then don’t also fill it with forests everywhere and make every house open. Do you have a smallish sector push map? Make sure the spawn points are placed far away from each other (look at Hurtgen for an example) and provide enough concealment for sneaky maneuvers.